Talk With Yah-Tay: Be In Charge!!! "Be Bold, Be In Charge"
Many women of Afrikan Heritage around the world are tossing the decision to go natural back and forth in their minds… Should I make the transition or should I not? This is a loaded question that goes deeper than just doing the “Big Chop!” It’s really about getting to know thyself and loving the natural essence of who you are. I’ve come across many black women who have made the “Big Chop” or who have transitioned by use of braids, weaves and wigs. 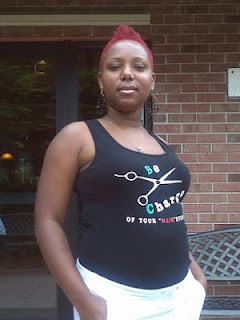 I transitioned from relaxed hair to wearing my natural hair some 13 years ago. I made the decision to do so, simply because I got tired of my scalp being irritated and the offensive stench of the harmful chemicals. I personally used braids to help me with my transformation because it was the best route to take due in part to me serving in the military. I struggled initially because I was dealing with my own issues of what real beauty meant internally as opposed to the world’s standard of beauty. I also had to contend with maintaining a well kept appearance by military standards. Returning to my natural state and embracing my real “HAIRitage” was a journey into self-awareness. I had to check my self-esteem barometer, as this was yet another level of getting to know myself. I didn’t have a natural hair support group nor was there a great number of black women “returning to their natural hair texture” at the time. So you can just imagine the obstacles I encountered. Although this was the case, I continued to “Be In Charge of My HAIR Story” and support others along the way, especially young black girls. Now we have all types of support circles and meetup groups to empower us to “BE” Naturally. It’s imperative that WE as “Naturals” continue to BLESS one another with positive words of encouragement, affirming who they are. I am really ready for my hair to be free and natural. My hair has been locked for years. Before it was locked I did not perm my hair for a year. I would sit for hours having some one add false braids to my hair. I got really tired of that process and then I would have to sit hours for my husband to help me take the braids out. Then I went straight to locks. I wished that I would have waited and embrace my natural loose hair. Because I had to sit for days to get the locks started and then get them maintain every 5-6 weeks which was not cheap money or time wise. Then my funds got tight and I had to learn how to retighten my locks myself which takes a lot of time. I literally hate to retighten them, however I do because they will lot like a hot mess. Why I have not cut them yet? I really don't know why. I have had very short hair before and my hair is very soft and silky. So I do not know what the fear is. It was very hard to get my hair to lock. The ends still have not locked after all these years. I guess you can say that my natural hair is resisting the locked state that it is in. Duh! It should have never been permed or locked, it should have been left free...Now when will I set it free...I will let you know that answer soon.